Today was our last SAPE faculty meeting of the semester. There was a big argument about requirements for the MA students: research and methods, advising for the thesis, language requirements, etc. Again I’m amazed that they have not figured this out before, but Scott in political science said that their department is having the same problems. We agree it is probably growing pains not unlike UHCL: when small, policies can be informal since there is a high degree of unity among the small number of faculty. As you get larger, you need to formalize (Weberian bureaucratization!! ), and this is the problem SAPE is facing. I met Amani at a Coffee Bean and Tea Leave café tonight next to the Nile Mall, and did a terrible job of remembering my vocabulary. I taught my last classes at AUC Fall 2009 for the semester: My 2pm Intro to Sociology and my 3:30pm Gender and Power in Development courses. Then I met with my RA Naseem and she gave me a bunch of material in Arabic and English on the plight of religious minorities in Egypt. Then I took the Zamelek bus to Zamelek for a Fulbright reception at Bruce and Annemarie’s house. This was the first time I had taken a Zamelek bus, so it was good to figure out that system. The bus stops right at Diwan Bookstore. Most of the scholars and student Fulbrighters were there. Me and Scott got a ride from Richard and Sussan back to Maadi. After working at home all day, I took Metro and a cab to Zamelek to have dinner with Karl Lorenz and Kathy Cain and their kids. Also unexpectedly visiting them was Sharron Brown, a teacher at their kids’ school who also happens to be the girls scout coordinator for Cairo. We took a nice walk through the Gazira Club grounds (where Kathy and Karl joined) and had tea at a restaurant. Kathy kept asking me questions about the Faith. The Gazira Club is huge, taking up the bottom 1/3 of the island of Zamalek. There is tennis, horses, golf, restaurants, hair stylists, etc., everything for the upper middle class Egyptians and a few expats. We went back to their house and I helped Karl make dinner. We had great conversation about our Fulbright experience so far, about their family trips to Upper Egypt and the Red Sea, etc. I didn’t leave until almost 11pm. This morning, I took the train to Dokki to the Fulbright office to participate in a panel to choose Fulbright candidates who would represent Egypt at US institutions. A packet of 3 candidate files had been delivered to my apartment last week, and I finished reading them this morning. One candidate’s proposal was in library science, one in sociology, and one in media and the use of the internet in political movements. The three candidates came in one by one and me, along with 1 Egyptian scholar and one representative from the US Embassy, asked questions about their project for 15 minutes. Afterward, we discussed them and ranked them on the spot, based not only on their academic proposal, but also the impression they gave in the interview on how they would adapt to a new culture, fit in, be flexible, etc. I took the train back to Tahrir, and then an AUC bus to campus. That evening I went to a faculty dinner theatre that started with dinner in the Faculty Lounge, and then we walked to the performing arts theatre on campus to see the Arabic-language play “The Thief”. I had gotten an English-language version of the script, but hadn’t time to read it before the play. I was able to catch a lot of it, and pretty much had the plot right as I watched the students perform. That made me feel good that I at least could catch the “drift” before an Egyptian student explained some of the details to me at intermission. After the play, I went to my office to Skype home with Katie and the girls using my office computer/built-in camera. After working on campus all day, I took the bus to the Tahrir AUC campus to listen to a talk given by professor of sociology and Middle Eastern studies, Dr. Asef Bayat, a Persian scholar who used to be at AUC but is now at the Leiden University in the Netherlands. He gave a talk from his most recent book, about so-called non-movement social movements. His basic idea was, based on Egypt and Iranian cases, was that what is going to create change in the Middle East in the next decade is not protest movements, but what he calls “non-movements” such as the urban poor, women, and youth/students. Non-movements are disorganized, fragmented, but are made up of demographic groups that are similar in outlook, oppression, and “passive networks.” 1) The urban poor non-movement evokes the same response from a regime: namely, panic and fear. Urban poor are squatters, who take over areas and put pressure for change on the regime without direct protest. 2) Women are slowly becoming more educated and taking professional jobs, and are changing the society from the bottom up, again without direct agitation in many cases. (He cited the movie “Divorce Iranian Style”). 3) Youth activism is an extension of “youth habitus” through sports clubs, Western dress and music, and because of their enormous demographic size will compel change without necessarily using protest. these groups use their agency in a time of control and constraint. Today was Thanksgiving—it was strange to think that back in the States, this was a big day, but was very ordinary here in Egypt. Around 4pm I went to Sussan Babaie and Richard’s for Turkey, stuffing, mashed potatoes and all the trimmings along with some of the expat Iranian community. When I got home that night, I Skyped with all the Lincoln cousins, Aunt Maggie, Janet, and Mom and Dad on Janet’s computer she had taken to Debbie’s. It was good to see everyone, but also felt lonely since I wasn’t even in Houston. Katie and the girls went to spend Thanksgiving with Janice and her family who are now in Houston—so I missed that too. Hard day after getting home from Sussan’s—but at least I had that to go to. Scott, Glen and I went out to an Indian restaurant on the Maadi Cornish called Bandara. We met some other Fulbrighters from up in Zamelek and had Indian Chi afterward. 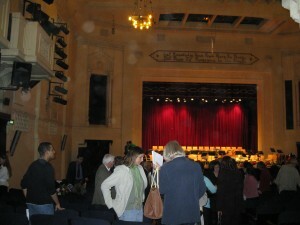 On Monday, Nov. 16, I went to a Cairo Brass Quintet concert at AUC Tahrir in Oriental Hall. The members were Egyptian, Russian, and Japanese! They were very good, and played mostly jazz, ragtime, New Orleans blues, and some more Middle Eastern music. On Tues, I went to hear a talk in the Political Science Department given by fellow Fulbrighter Scott Hibbert about religion and politics in the US elections in the last 25 years. On Wednesday, Egypt played Algeria in a winner-take-all situation for the last African spot in the 2010 World Cup. The game was in Sudan, and I went over the Sussan Babaie and Richard’s to watch the game. Sussan’s mother and cousin were there visiting as well. We had dinner and then watched the game. Egypt played terrible, and lost 1-0, squashing their hopes of being in the World Cup for the first time in 20 years. In the days after the match, there were unsubstantiated reports that Algerians attacked Egyptians in the Sudan, and some people were barricaded in buildings and couldn’t get back to Egypt. Rumors that famous Egyptians—actors and singers, and Mubarak’s two sons—were also fearful of their lives just added to the drama. The next day, there were reports (even a Warden message from the US embassy to all Americans living in Cairo) that Egyptians had surrounded the Algerian embassy in Zamelak and were throwing Molotov cocktails and breaking windows were also spreading. Reports of deaths on both sides were also swirling around. I suggested to my students the next week that we really don’t know the truth about who started what, and they were aghast that I would even suggest that Egyptians started the problem. They didn’t like the idea I touted that maybe the Egyptian government was even using reports of Algerian abuse to their advantage to deflect criticism away from the regime. On Thursday, I met Hassan Awad in front of the Imam Hussain mosque in Khan-i-Khalili. He had called and said that he was conducting a tour from the US, and had this evening free while in Cairo. It was great to see him, and we sat in a coffee house and had tea. Then we walked to the Attaba Metro station for me to journey back to Maadi and he was going to bed early to be ready for his tour tomorrow. Tonight, after working all day at home, I met Amani my Arabic tutor at the AUC Tahrir campus at the old Falaki Building for Arabic lessons—we covered “the family”. I then ate dinner at Felfela off of Talat-Harb Street in downtown, and then went back to AUC downtown at Oriental Hall and listened to a concert of David Pavolvits, a Hungarian composer-guitarist. I then walked down Talet-Harb Street to Felfela’s restaurant and had my usual Foul and Tamia dinner, while reading my Intro sociology book for the next lecture. We had a faculty meeting today at AUC in the Department of Sociology, Anthropology, Psychology and Egyptology. When the whole department meets, there are still only about 30 people around the large conference table. Often, we only meet as Sociology and Anthropology program meetings. The chair of the whole department is Helen Rizzo, the women who I talked to for two summers in preparation for applying for the Fulbright. The head of sociology is Nazek Nossier, the woman I met last summer (2008) and who eventually wrote the letter of support that I uploaded to Fulbright the day we left for our Nebraska/Missouri vacation. In some ways, the department is very disorganized. They are trying to establish a Coptic Studies concentration or diploma (different from a major), and so are trying to figure out how to incorporate the Coptic into SAPE. The graduate sociology major (MA) does not require a statistics course, although they do have a Research Methods class (probably an artifact of sociology and anthropology being tied so closely—no Anthropologist would want to take statistics. There is also the problem of the language requirement—all MA students in soc/anth must have Arabic of some form for a language requirement. The thinking has been that students need it to engage in field work in Egypt. But, there is not standard process of testing, no required score for the Arabic exam, no consistency of whether Fusha (Modern Standard Arabic) or Ameia (Egyptian dialect Arabic) is tested, and no consistency of who administers the test (up until this point, it has been the MA thesis director, even if they don’t speak Arabic). Anyway, I would have thought that these issues would have been decided long ago, but apparently not. It may also reflect the issue of with the move last year to the new campus, all programs are undergoing a reflexive process to see who they want to be at AUC attempts to become a “world-class university.” SAPE is struggling in that respect. This afternoon, I helped set up for the American Studies “Global Dialog” video conference between students at AUC and students at Georgetown University in Doha, Qatar and Fordham and Columbia Universities in New York. Several of my students from the Intro to Sociology came to the video conference and participated by making comments or asking students at other campuses questions. The conference was sponsored by the Levin Institute in New York and chaired by former CNN anchor Garreck Utley. I was also at the table and Jerry Leach, who was moderating our AUC end, unexpectedly introduced me and asked my opinion about some aspect of the discussion. 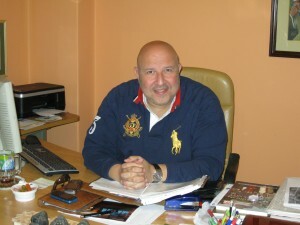 The whole conference was predicated around the Cairo University speech by President Barack Obama this past June, 2009. They showed clips, and then asked the students to comment on the issues of Iraq, Afghanistan, and Palestinian-Israeli conflicts. Most students were unsure of the direction to go to ensure Middle East peace, but all agreed that the US should do more, and Arab countries should also clean up their own act and do more as well. The conference went almost an hour past its 1.5 hour limit because of the great discussion, and it may be edited down into a ½ hour or hour documentary on PBS. Katie’s birthday. I Skyped her this afternoon from my AUC office and we talked nearly 1.5 hours. It was nice to talk with her without the girls jumping around. After working at AUC all day, I met Amani Assem, my Arabic tutor, at the Tahrir AUC campus in the courtyard of the old Falaki Building (where Dr. Helen Rizzo had her office 2 years ago when I came to beg her for a letter of support for my Fulbright application). Amani is a fantastic tutor, and also very knowledgeable about Islamic philosophy, practice, and Qur’anic interpretation. She has worked as a translator for websites that explain Islamic concepts to Western Muslims in English. We frequently discuss Islam before getting to the tutoring. We either meet at Creperie Des Arts café on Misr-Helwan Road in Maadi, or at AUC campus. We have also met at the Metro on Misr-Helwan Road to learn fruits and vegetables (bitingen!). On this day we met at the Falaki Building at downtown AUC and discussed Days of the Week/Month. She then had to teach an English class to Arabic speakers, and I walked down Talat-Harb Street to have dinner at Café Riche, overlooking Talat-Harb Midan. I took the train back to Maadi around 9pm. I then went to the Opera House to see if I could attend a showing of a film at the Cairo International Film Festival, but instead of finding a screening, they were set up to interview some Egyptian film celebrities on Egyptian TV. I watched the interviews for while, but then walked over to the Museum of Egyptian Modern Art (there in the same Opera House complex) and paid the 10LE to get in. For an Egyptian museum, it was pretty well-maintained. My favorite piece was a paining by _____ of Sufi Whirling Dervishes. Tonight at AUC campus, I went to the Lebanese film “XXXXX”. It was all in Arabic, with English subtitles. It was about a woman who loved the music of Um Kalthum, the great Egyptian singer, and as anti-American sentiment grew with the Iraqi war, her family became more and more suspicious of her behavior in learning about Lebanese and Egyptian singers. It ended with her Father and brothers doing an “honor killing” because of a suspected affair—in front of her 3 children. The student announcer said that this film had been banned in Egypt, but was being show at the Arab Film Festival at AUC. After working at the apartment all day on “the d&$#@ book”, I took the train downtown to the Tahrir Campus of AUC. 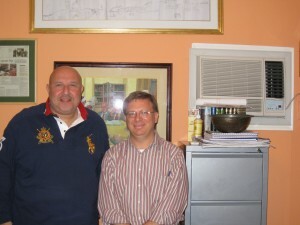 I found the Falaki Building and met Jerry Leach of the American Studies department, as well as several of his students. We talked about the Palestinian—Israeli conflict to prep the students for the video conference between AUC, Georgetown University in Doha, and Columbia University in New York next week. We had an interesting discussion about peace in the Middle East, Muslim relations with Jews, and how the American government needs to stand firm against Israeli settlement construction in the West Bank, according to all the Egyptian students. We then went to Pizza Hut on _____street by AUC downtown main entrance and all squeezed into a booth and had a pizza. 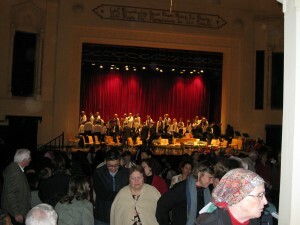 I left the group, and took the train to the Cairo Opera House for a performance at the Arab Music Festival. There were two groups: the first was a 7-member guitar and percussion group led by a young Egyptian man playing a traditional Arab stringed instrument (I don’t know what it is called, but it has a bent neck where the frets are). After intermission, then a symphony came out with a traditional male Egyptian singer singing what I have come to call “Um Kalthum” music—in that style. He was fantastic. An older man sat in front of me, and you could tell he came to hear this style music—he clapped very long and hard. He must have sang traditional songs that most of the older audience knew, because people were clapping even before the songs ended. I worked at home today, and at lunchtime, I went to lunch at the Green Mill with Scott Hibbert’s parents, who were in town visiting. She was very good, and introduced by Frank Bradley (who lives in Apartment 1 in my building). After the performance in Oriental Hall at AUC, I went town Sharia Talet Harb street to the famous Groppi’s coffeehouse. This was a prime hanging out site during the heady heyday of pre-revolutionary Cairo in the 1930s and 1940s. Now, the entry room is bare, with the exception of some pastry display cases and a cash register—not even any tables. In the back room, some dingy tables are arranged on two levels. Waiters in old colonial garb stroll through the café to get your tea or clear your table. I ordered Turkish coffee and a piece of chocolate cake, and read for my lecture the next day. Again, I am reminded of what some of us said in Alexandria: faded spender of a bygone era. I worked at home today, and then met Amani at the Creperie Des Arts restaurant, but instead of a lesson, her driver took us to Mohandaseen so I could meet Mr. Cherif Asmat Abd Al-Maguid, the founder of the Islamic Hotline. This is a service run in conjunction with Al-Azhar University to answer anonymously questions Muslims have about their faith by scholars trained at Al-Azhar. They have answered over 20,000 responses in the last 9 years. He was a fascinating man, very spiritual, very humble, and spent almost 2 hours talking with Amani and me. Then Amani’s driver dropped me off at Tahrir Metro, and I took the train to Saray El Kobba Metro station where I was picked up by Shaza Gamal, the Coptic art scholar we have met in our summer travels to Egypt. We drove through Heliopolis to “Planet Africa” a themed restaurant just like “Rainforest Café” back in the US. We had a nice dinner, and talked about AUC and Helwan University, where she just a few months ago got promoted to Associate Professor. She took me back to the train station, and I went back to Maadi and my apartment where I started reading a book on Islamic Philosophy.